Swansea's actions in parting company with boss Garry Monk were "crazy" and a "very bad decision", says Southampton boss Ronald Koeman. 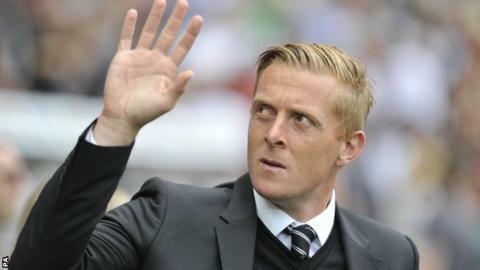 Monk left the Liberty Stadium on Wednesday but guided the Swans to eighth place in the Premier League last season. "He can't do every season what he did last year," Koeman told BBC Radio Solent. "It's not what Monk deserves. Why couldn't he turn it around?" Koeman was widely praised for leading the Saints to a seventh-placed finish last season - one position above Monk's Swansea - but has seen his side fail to win their last four games. He added: "It's strange. It means everybody must be looking at their jobs because he had a great season last year at Swansea, he did a great job. They had a good start to the season so they have been struggling for maybe two months. "He could have a good finish to the season. It's not my way for how football needs to be for managers. "Maybe you will be asking me [about my job] if we don't win the next match?" Southampton face Crystal Palace at Selhurst Park on Saturday while an announcement about Swansea's management structure for Saturday's match at Manchester City "will be confirmed in due course".